FILE - In this April 23, 2016 file photo, Solar Impulse 2 lands at Moffett Field in Mountain View, Calif., completing the leg of its journey from Hawaii in its attempt to circumnavigate the globe. 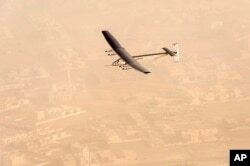 The solar-powered airplane, Solar Impuse 2, is on the latest leg of its around-the-world flight. Solar Impulse 2 took off Monday from Mountain View, California, just south of San Francisco, and is on a 16 hour flight to Phoenix, Arizona. Swiss pilots Andre Borschberg and Bertrand Piccard landed in Mountain View last week after a three day trip from Hawaii. After departing Phoenix, the plane will make two more stops in the United States before crossing the Atlantic Ocean to Europe or northern Africa. FILE - Solar Impulse 2 flies over San Francisco, April 23, 2016. Although the trip is incomplete, the technology that relies only on the sun's energy is a success. "We have demonstrated it is feasible to fly many days, many nights, that the technology works," Borschberg said. If the journey to circumnavigate the world is successful, it will likely provide a boost to the renewable energy industry. Solar Impulse 2 has a 236-foot wingspan, longer than that of a Boeing 747. It is equipped with more than 17,000 solar cells that power propellers and charge batteries, which store energy for night-time flight. FILE - In this photo released by Solar Impulse, "Solar Impulse 2", a solar-powered airplane flies after taking off from Al-Bateen Executive Airport in Abu Dhabi, United Arab Emirates, March 9, 2015. The voyage began in March 2015, taking off from Abu Dhabi, the capital of the United Arab Emirates, and made stops in Oman, Myanmar, China and Japan. But the plane's battery system sustained heat damage during its flight from Japan, forcing a nine-month layover in Hawaii for repairs.